It is not uncommon for litigation to stem from disagreements over the value of privately-held companies and ownership interests in those entities. In those situations, the parties often discuss many different values as they attempt to reach a resolution. It is important to make sure that the parties are speaking the same language as far as the type of value being considered: equity value, enterprise value or invested capital value. While these three types of value are related there are significant differences among them, and understanding those differences is important in reaching a fair resolution. With this in mind, we will walk through the differences in equity, enterprise and invested capital value to give attorneys additional tools to effectively navigate valuation-related disputes and negotiations. The Fall edition of Family Lawyer Magazine published an article I authored titled, “All Company Values Are Not Created Equal.” In it, I discuss how a company’s “equity value” can be vastly different from its “enterprise value,” which may differ from its “invested capital value” and why you must establish which type of value is being determined when discussing company value. 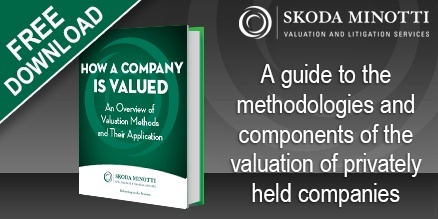 Do you have questions about the different levels of capital structure value, or other valuation-related matters? Please contact Sean Saari, CPA/ABV/CVA/MBA, at 440-449-6800 or ssaari@skodaminotti.com. This entry was posted in Mailchimp RSS, Valuation & Litigation Services and tagged business valuation, capital structure, company, Enterprise Value, equity value, invested capital value, litigation. Bookmark the permalink. Follow any comments here with the RSS feed for this post. Comments are closed, but you can leave a trackback: Trackback URL.